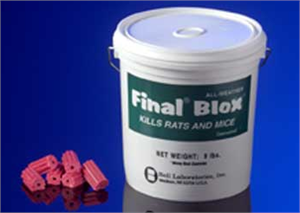 These Final Blox Rat & Mice Killer combines Bell's highly palatable rodent bait formulation with the powerful active ingredient, Brodifacoum, for the strongest, single-feeding anticoagulant on the market today! FINAL blox are effective on both rats AND mice. It works especially well to clean out persistent mouse infestations where control is difficult or resistance is suspected. Bell formulates FINAL bait with more than 16 human food-grade, inert ingredients for a flavor rats and mice can't resist. When tested against other Pro baits on the market, FINAL All Weather Blox are the preferred bait for rats and mice. Bell's FINAL blocks are colored red for easy identification and the FINAL BLOX come in a distinctive cog shape. Final Blox use Brodifacoum, making this another one of our many green pest control products! THIS SIZE IS NO LONGER AVAILABLE FROM THE MANUFACTURER.. WE APOLOGIZE. Would you like to see the Final All Weather Blox MSDSsheet?